This is the third of a special three-part series. The environmental goals laid out in the important Party document, the “Opinions of the CPC Central Committee and the State Council on Further Promoting the Development of Ecological Civilization”, introduced here, are laudable and ambitious. However, many of these can be found in other high-level plans and pledges. Many Chinese policymakers have long wished to shift the economy to a greener path, but enforcement has often been thwarted in the past by a fatal combination of fragmentation, secrecy, collusion and repression. The last four sections of the “Opinions” set out how the government hopes to reform the governance of China’s “ecological civilisation”. A key approach, set out in section six of the text proposes a “comprehensive system of ecological civilization”. This includes improved legislation, enhanced compatibility between China’s many environment-related laws, and revisions to existing laws, such as the Prevention and Control of Atmospheric Pollution Law, the Water Pollution Prevention and Control Law and the Energy Conservation Law. China, as the text states, promises to “speed up the formulation of a number of standards regarding energy consumption, water consumption, land consumption, pollutant emissions and environmental quality”, including the introduction of the top-runner scheme in energy efficiency, borrowed from Japan’s industrial policy, where it was a notable success. The document also emphasises the need to “improve the system of property rights of natural resource assets” and “stick to and improve the most stringent systems of cultivated land protection and land conservation”: measures that seem designed to curb “land-grabbing” by local officials and developers in rural areas. Economic policies, it says, including “pricing, fiscal, taxation and financial policies” should “motivate and guide various entities to actively take part in the development of ecological civilization”. This includes environmental taxes, seen recently in a new draft law, which would favour energy conservation and environmentally friendly production. There is approval, too, for “market-based mechanisms” to promote environmental goals, and labeling schemes for better energy efficiency and promotion of organic products. Pilot carbon trading programmes will be “intensified” and a national carbon market established, alongside stepped up efforts on pilot trading programmes of water rights and the regulation of the water rights market. It also highlights the need to improve “compensation for ecological protection”, referring to payments for ecosystems services, such as fiscal incentives to avoid deforestation. There is a promise of long-needed reforms in “the system of government performance assessment” – the report card that judges the performance of Chinese officials against criteria set from above. 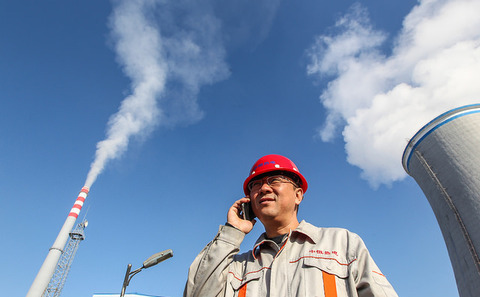 At the heart of China’s environmental enforcement problem – and hence its ecological crisis – has been the mismatch between ambitious central government policies and local political evaluation systems, which have promoted officials for their success in achieving fast GDP growth. Officials have rarely been punished for permitting environmental violations, and this has often led to collusion between polluters and officials, who have happily overridden the efforts of environmental authorities. This text makes an explicit pledge to abandon “the concept of regarding economic growth as the only criterion in government performance assessment”, and promises to align as well the “targets, assessment, rewards and punishments to the requirements for ecological civilization”. In the future, it states, performance assessment will prioritise agriculture in mainly agricultural areas and ecological protection to areas critical to ecological function. It also promises to prepare a “balance sheet of natural resources” and to audit how well outgoing officials have taken care of natural resource assets and the environment, an approach reminiscent of earlier experiments in “Green GDP.” This was an earlier attempt to adjust national growth metrics to take account of pollution costs and natural resources depletion, which once showed great promise but was unexpectedly shelved in 2007. Significantly, the document proposes a new “lifelong accountability system” for officials, which would prevent officials from achieving promotions that could obscure a prior record of environmental destruction and would “investigate the regulatory accountability of officials who perform their duty perfunctorily, conduct weak regulation, neglect their duty and perform malfeasance according to discipline and law”. Resonating with a recent crackdown on corruption among China’s environmental officials, this section reminds them that “officials are forbidden to illegally intervene in law enforcement activities”. Taken together, these governance reforms could be crucial steps in achieving and enforcing environmental goals in China. Part eight focuses on “accelerating the cultivation of good social morals” for promoting ecological civilisation. Despite its overtones of paternalism, (it also contains a reference to “fostering rational and positive public opinion”, for example), it mainly refers to: environmental education in schools, communities and government; giving “full play to the role of news media”; promoting awareness about green policies and principles; fostering “green lifestyles” among the public and officials through publicity campaigns, with an emphasis on “thrifty, green and low-carbon” ways of living, and “reporting advanced models” while “exposing negative examples”. In other words, sustainable consumption campaigns, which will be familiar to many people in advanced economies – with an encouraging focus on environmental education for officials, as well as the public. It also strongly supports the “need to encourage active public participation”. This refers to civil society oversight of environmental regulation with a specific commitment to: accurate and timely environmental information disclosure; the expansion of the “scope” of this transparency; guaranteeing “the public right to know”; safeguarding the “environmental rights and interests of the public”; and improving “the systems of whistle blowing”, public hearings and “public environmental interest litigation”. It promises that ecological civilisation “will expand public participation in the initiation, implementation and post-assessment of construction projects in an orderly manner” and that it will “guide all types of social organizations…to pursue healthy and orderly development and give play to the role of NGOs and volunteers”. These words might hearten those in Chinese civil society, long at the forefront of efforts to clean up the development model, whose options are often restricted by the government’s fears for “social stability”. The final section is titled “earnestly strengthening organizational leadership”, or the government’s role in environmental governance. This puts the Party at the helm of the ecological civilisation effort, with “relevant departments” working in coordination to create “powerful synergies”. It exhorts different regions to “identify the bottleneck that restricts the local development of ecological civilization” and “work actively to practice innovations in the system of ecological civilization”, and calls on China to “carry out extensive international cooperation” and “build up the image of a major responsible country and transform green development into new comprehensive national strength”. In doing so, the document sets out ways in which government at different levels must implement these principles, through “regional, sectoral and special plans” based on the text, defining “targets, tasks, division of duties and responsibilities as well as timing,” to ensure “all policies and measures are implemented to the letter”. In conclusion, the text seems to signal a real shift in governance approaches, set out at the highest level. “Opinions of the CPC Central Committee and the State Council on Further Promoting the Development of Ecological Civilization” is an encouraging, exhaustive and long-term blueprint for a greener economy and society. It addresses implementation mechanisms more thoroughly than previous high-level pronouncements. And it signals changes that many environmentalists will welcome: a system that no longer protects or rewards polluters, but instead supports clean technology innovation and defends its natural ecosystems. Taken together, these proposals suggest that China’s effort to build an “ecological civilisation” has been awarded high priority. This is the third article in a three-part series, please read the first installment here and second installment here. As China’s new leaders prepare to take office, chinadialogue looks back at how the Communist Party’s environmental vocabulary has changed over the decades.